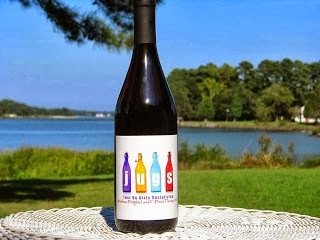 We are already at Letter S, and Grandma J is so tired of rusty animals and overcooked vegetables that she decided to go with an honored profession. Not that she knows anything about the profession itself, but she knows a whole lot about the professionals. Do you now what profession Grandma J is talking about? 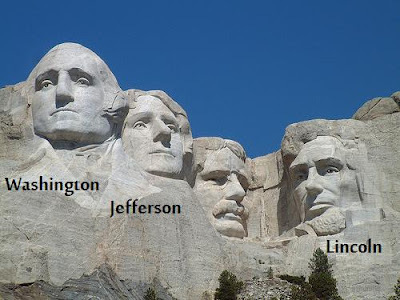 All four of these great men were Presidents of the United States. Three of them were Surveyors. You guessed it, didn't you? I knew you would. I worked with surveyors for several years. They climbed mountains, swam oceans and flew into the heavens. Then they woke up and went to work. Actually, they did all of that...well I'm not sure they considered it work, maybe more like a passion. Unfortunately, no one could find this one to take a picture for me. 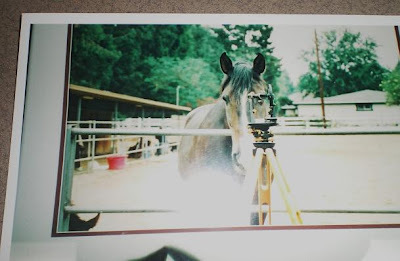 I found this picture of a picture that I took in 2001 of the same hard working surveyor . I do know a surveyor clear across the country in the state of Virginia. Here is Cool Breeze Musings with his crew, Big Hair Envy. I can't wait to meet them at the Virginia Blogfest in July. Will you be there? brought to you by A to Z Mondays, Check it out, and come join us. Those are nice shots. My "S" for today is a four letter word. :-) "S**t! It's Monday!" Ha!!! As soon as I realized you weren't talking about sculptors, I said, "Hmm. Wonder if she knows BHE's husband is a surveyor." I said that because I have been up since 4:30, have to work today and have not had my caffeine yet. Of course you knew that! Hilarious picture, that last one. Oh, and I'll be at Blog Fest. I think. I didn't know Jefferson was a surveyor. Those pictures give new meaning to the phrase "work horse". Now that's an original S post! At first, I thought that was a picture of Rachel Alexandra checking out the track before the race. I love your CB/BHE picture. Are you going to give a blogger photo-art seminar at the blogger fest? You always have such clever pictures on your blog. I would love to be there to meet everyone, but not sure I can work it out. 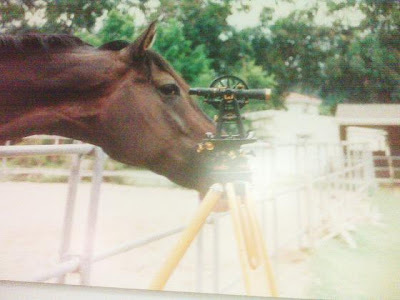 Yeah, those surveyors are a special breed!!! They don't last long if they're not passionate about it....the field work can be grueling. CB was featured in Professional Surveyor Magazine this month. Check it out! South Dakota is what I thought you were going for. I learned something new, did not know this. Why do surveyors always stand in the middle of the road? That horse picture is the coolest!! Grandma J you are so clever!! 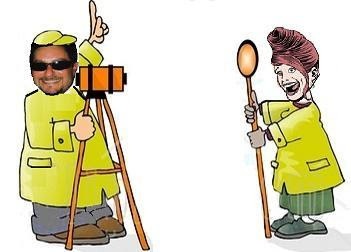 I never would have come up with surveyor...not in a million years! Great "S" post!! Very cute. Great S word...and yet again, I have learned something. Do horses recieve health benefits in that profession??? I sooo want to go to the blogfest!!!!!! So Sweet Sugar! Love those those Surveyors! I hope to make the blogfest. I love your blog Sweetie. There were surveyors hard at work in the Grand Canyon last week. Wonder what they were measuring? Surveyor was the only "S" word I could think of. I really miss those guys!! I must say that I'm really flattered. We surveyor's are a special breed if I do say so myself. I'd like to think I fit into the same category as those special men. They have certainly influenced my life in more ways than one. Hey Jen ... so we don't have to look through the trees. Woody ... that sounds intense. I've never surveyed anywhere like that. I'm somewhat envious. GJ ... here is the link to the article. Cool Breeze, the article is quite impressive, and being first in a series in a national publication is even more so. Now THAT is an 'S' word I did not see coming. Great choice! Your post and Jen's post about seahorses are so educational. I love them! And PS Brilliant S. I would expect nothing less! Gee Grama thanks for the history lesson. I never knew those 3 POTUS were surveyors! My Dad (RIP) loved to get out his equipment and survey his properties. A passion---YES!! Thanks for the terrific S!